Discussion in 'Nikon' started by paul_wheeler|1, Sep 10, 2010. I have spent a while searching online and I've been left slightly confused. The older original VR version of the 300mm f2.8, seems to have two types of images associated with it. On the golden/brass name plate, one has the Nano "N" and the other has the "ED" symbol instead. Both show the red VR mark. I understood that both VR and VR II versions have the Nano coating, but what about the VR with only "ED", and not "N" on the plate? 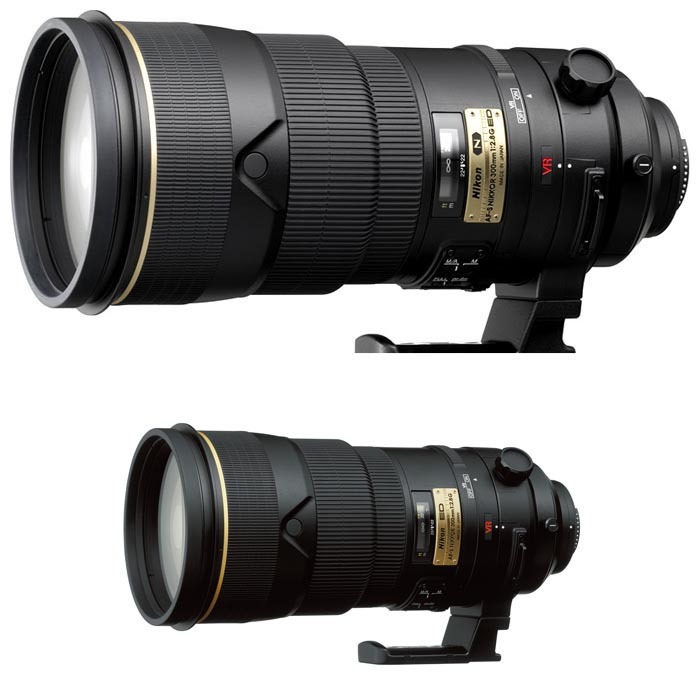 A quick search for images of Nikkor 300mm F2.8 AF-S VR ED on Google with show what I mean. This serial number chart might be of a little help. I actually think some second-hand sites are using images of the newer model while describing the older model. On reflection, the VR marks may not be red. I would still like clarification on whether all VR models of the 300mm f 2.8 have the Nano lens coating. The new version has what Nikon calls VR2, improved VR. Both vesions have nano coating, although that terms was not widely used back in 2004 when version 1 was introduced. Nikon started heavily advertising nano coating in August 2007 when they introduced a bunch of high-end lenses along with the original D3 and D300. Current lenses with nano coating have a black-on-gold N symbol to emphasis that feature. I have searched and found lenses with the older red VR symbol (ie not gold), one with "N" and the other "ED". My understanding was, as you say, both versions have the Nano coating. My confusion was caused by finding two cosmetically different VR I lenses. I understand there are VR I and VR II versions, but my question referred to what seem to be two versions of the older VR I lens as shown above. Paul, you are showing images of the old version. It looks like Nikon changed the plate on the barrel. As I said, Nikon started advertising about nano coating in 2007 and apparently they added the N symbol to version 1 later on. The old version only has two settings: M/A (auto focus w/ manual override) and M (manual). That should be the easiest way to tell them apart. Thanks again Shun, but the reason I have shown the images of the older version, is because I am looking at locating and buying a used copy. My original post and subsequent questions all concern the old VR I version. I know how to tell versions I and II apart. That is not my problem. Perhaps I did not make my post clear enough? To clarify, all I want to know is whether the lower lens in the picture above definitely has Nano? That page has the same lens image as your second one for the older version and it lists that the lens has nano coating. When the new version was announced last December, I checked with Nikon USA and they confirmed that the old version also has nano coating. As far as I know, Nikon never changed the optical formula; in fact, versions 1 and 2 have the same optics. The main difference is VR vs. the improved VR2 (and the new A/M switch setting). My guess is that since Nikon started advertising nano coating, they changed the plate on the barrel on the older version. Nano coating was explicitely mentioned even back in 2004. Thanks Shun. I have looked again at the link you posted and that has clarified matters. Thank you. I have started a new thread referring to my comments above.